Turkey tail mushrooms (also known as Trametes versicolor, Coriolus versicolor, and Polyporus versicolor) are well-known for their medicinal and therapeutic benefits. They are typically multi-colored and have concentric bands of contrasting shades. They often appear in shades of gray, brown, red, blue, and black. These mushrooms are commonly found in large colonies in woodlands of Europe and Asia. In fact, turkey tail mushroom is an active ingredient in Chinese medicinal tea. 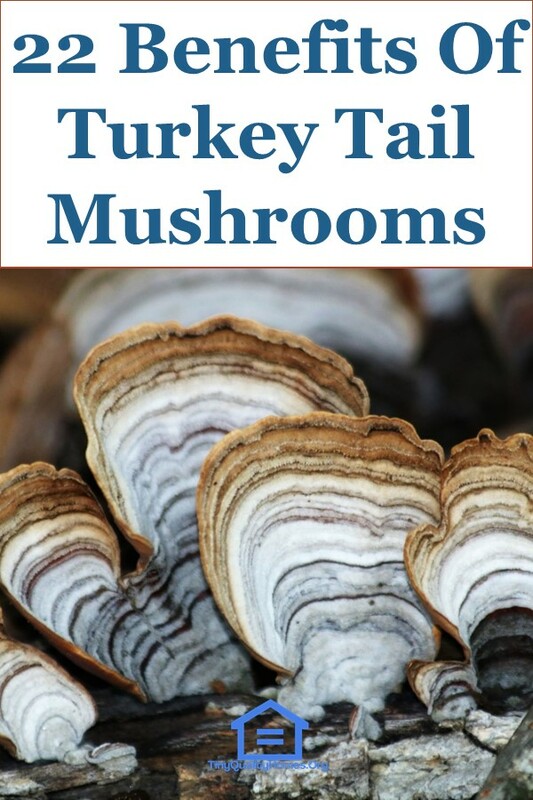 Turkey tail mushrooms are rich in multivitamins and minerals. As such, they are a good nutritional addition to one’s diet. They are a rich source of niacin, riboflavin, and potassium. Turkey tail mushroom also contains copper, phosphorus, and pantothenic acid. Turkey tail mushroom’s sodium content is low. It has no cholesterol and gluten. It is also low in calories. Turkey tail mushrooms help in mitigating and reducing the level of LDL or bad cholesterol in the cardiovascular system just like numerous other kinds of mushrooms. Turkey tail mushrooms have been used for various diseases, including lung cancer. They help the lungs to flush out harmful particles you breathe in every day and helps to regenerate healthy tissues, while at the same time slowing the deterioration of current cells. Turkey tail mushrooms contain PSK (protein-bound polysaccharide krestin ) and PSP (polysaccharide peptide). These are known for their immunomodulating properties and have been claimed to be the active constituents, in turkey tail mushrooms, that fight off cancer cells. Turkey tail mushrooms is also rich in numerous other antioxidants, which make your immune system more potent. PSP and PSK are both labeled as beta-glucans. These are beneficial to your small intestines’ receptors resulting in better immune response and performance. Because mushrooms contain pre and probiotic food constituents, they stimulate both your upper and lower gut flora that includes your stomach, small intestines, and large intestines. Gut flora is essential for mental and physical health. The gut is the place where a number of major components responsible for your sleeping patterns, focus, irritability, and thyroid functionality, reside. This is also where the production of stomach acid is taking place. Have that out of balance and you could expect excess fat stored in your body, hormonal imbalances, constipation, and chronic fatigue, as your body is required to use more energy to deal with undigested food. Turkey tail mushrooms contain lots of vitamin D3 and the whole B-Complex spectrum! If you didn’t spend much time in the sunlight last summer, you would probably feel the consequences of that in the winter. This often manifests as a lack of motivation, lack of energy, slower brain processing, and even depression. Vitamin D3 would be vital to prevent this, as we cannot function properly without it. Vitamin B also plays a major role in your body’s functions affecting your gut, vision, mental health, and mood. This particular fungus is not only rich in vitamins, but it is also rich in minerals, that positively interact with your body and nourishes your cells; for example potassium. Turkey tail mushrooms are quite effective in inhibiting cancer cells. They are especially good for breast cancer and can be easily used with chemotherapies. Because they boost your immune system, your body can deal with cancer cells more efficiently. An inflow of additional NK cells ( natural killers ) and CD8+T, as well as an increased amount of lymphocytes, vitamins, and minerals help improve a patient’s wellness and health. A 2012 study linked the beneficial effect of turkey tail mushrooms to the survival of patients with gastric, breast, and colorectal cancer. Whether it’s lung, breast or prostate cancer, turkey tail mushrooms are quite popular to use in conjunction with chemotherapies related to these illnesses, as they slow down the growth of cancer cells and contribute to the process of healing, by quickly rebuilding of new healthy cells. By being a natural and strong immune booster, it’s definitely worth a shot, even in your daily life. Because chemotherapy suppresses your natural defenses, you need to work on restoring these natural defenses and turkey tail Mushroom seems like a good choice. You can add it to your diet whenever you want, there are numerous ways for you to consume them. Yes, this is actually a fact. Ancient Asian cultures knew about the healing properties of this fungi. One way they used to implement it into their diet, was to boil them in water making a healthy drink. The healing benefits you get from these mushrooms are more potent than if you were to eat a normal mushroom. Why? Because your body can more easily absorb it, especially in tea form, and doesn’t need to waste extra energy to break down the food. Selenium is particularly useful if you are poisoned with mercury, or just have it too much in your body in general. Your body doesn’t really have an ability to deal with it, and that’s when selenium comes to your aid. Once selenium and mercury combine together, they form a totally new and harmless compound, that doesn’t have a negative effect on you. Now, while turkey tail Mushroom can be rich with selenium, they can also be full of heavy metals, that if taken in excess, can be dangerous for you. Always consider environmental factors, if gathering the mushrooms yourself or buy only from reputable and reliable sources. Turkey tail mushrooms can be found pretty much everywhere, although reports say that most of them grow in Europe and China. They grow on dead trees, branches, etc. They are usually found in colonies, but I’m pretty sure you can find some isolated ones out there. Turkey tail mushrooms have been acknowledged by many medical institutions as beneficial, and have been used in numerous medical treatments all around the world. They are most commonly used in Chinese medicine in the form of tea. However, there are many ways by which nutrition can be extracted. They are widely available in Japanese market as an adjuvant anti-cancer drug. It has been scientifically proven, that they are safe to use, as long as it’s usage is supervised by a certified doctor. These potent mushrooms are highly loaded with antioxidants which are helpful in getting rid of harmful free radicals that are produced during the oxidation of molecules that can, in turn, lead to cell deterioration. Even though our bodies have innate enzyme systems, turkey tail mushrooms can enhance and restore them for better overall health. This can help diabetics to better deal with their illness. As you get healthier by taking in this highly nutritious and supportive mushroom, you are also regulating stress levels and healing chronic fatigue. Because it’s restoring your gut flora and intestinal area, your hormones and cortisol levels are being rebalanced leading to a more stable state of mind and body. Remember that rest and emotional balance also play a big role in that. So don’t rely solely on these mushrooms. Many Chinese and Japanese people say that turkey tail mushrooms are a symbol of longevity, as they contain a lot of nutrition and minerals, that regulate your body’s functions and reverse the aging process. You can even find copper in this type of mushroom, which is essential for your muscular system, and also has anti-inflammatory properties. In addition, this mushroom stimulates your immune system. With your immunity enhanced, lots of antioxidants and huge nutritional content, turkey tail mushrooms are effective for cold and flu. It can help you fight off the most common diseases and even prevent them in the first place. So, next time you feel a little bit under the weather, try some turkey tail mushrooms! Turkey tail mushrooms help in the healing process of skin cancers caused by HIV/AIDS. These mushrooms also help to improve the general wellbeing of such patients. This is actually interesting and you might not know this, even if you are a big fan of turkey tail mushrooms. You can naturally increase the amount of vitamin D2 by exposing the back side of this mushroom to the sunlight. When UV interacts with this particular area, a chemical reaction takes place and the outcome is higher vitamin D2 content. Because turkey tail mushrooms have anti-inflammatory properties, it instantly reduces susceptibility to numerous infections. Together with its antioxidants as well as prebiotic and probiotic changes in your gut flora, your body’s immune system would be stronger. This makes it easy for your body to fight off numerous microbes, that would tend to attack you. White blood cells are an inherent part of your immune system, that protects you against external invaders, which try to penetrate your defenses. White blood cells are produced from bone marrows. Turkey tail helps in the regeneration of the bone marrow. Turkey tail mushroom is capable of inhibiting oral human papillomavirus. From the reports of people using turkey tail mushrooms, a list has been made that contain the side effects one could experience. Fortunately, it is not a long list and not scary at all, as even if they occur, they should be easy to deal with. The side effects that might occur are; 1) Diarrhea 2) Darkened Stools 3) Darkened Nail Pigmentation. As you can see, they are relatively not serious. That doesn’t mean you shouldn’t contact your doctor immediately, should any of these emerge, as it can be only a precursor of something more dangerous.